Next week I travel to New Orleans to speak to an audience of CEO’s in a Vistage Group facilitated by Joe Liss, CPA. Joe has been a good friend and mentor for many years. Back to this audience. These people own their companies. CEO’s expect performance. They want good ideas and hate wasting time. They want me to give them great, actionable ideas to help them sell more, lead their teams, hire better people, and grow their businesses. This won’t be 30,000 foot platitudes. It will be rapid-fire, actionable ideas… for three and a half hours. The pressure is on. I must stay cool, calm, and collected. I believe in system redundancy. I insist in having two bottles of roll-on deodorant; one for home and one for my travel bag. This morning I used the last of one bottle. While I am not obsessive-compulsive, I did run into Walmart on the way to my office – the photo above is what I saw. What was amazing is they didn’t have my brand! So I left. I’ll try another store, probably today. What lessons came out of this 6:45 AM jaunt into the largest retailer in the world? We live in a great country. We grow enough food to feed ourselves and the world. Most people can work if they want to work. They can freely practice their religion. Americans have a greater choice of products and services than anywhere in the world. 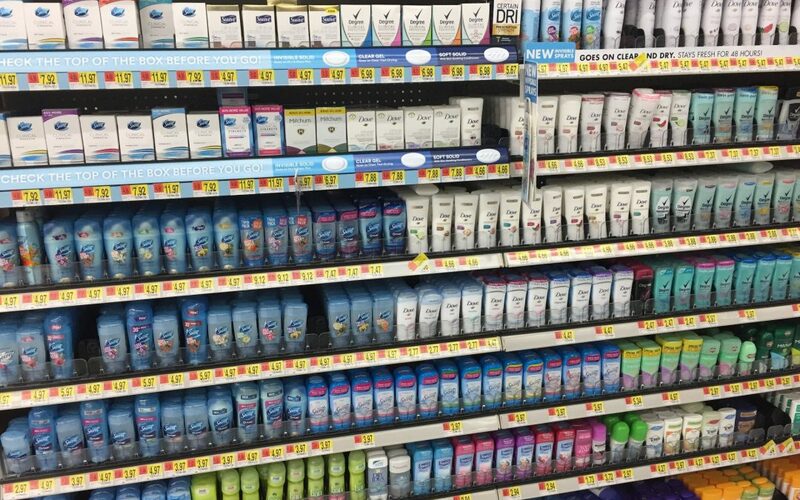 And more brands of antiperspirant / deodorant exist than one could try in a lifetime. As Sheena Iyengar, a professor of business at Columbia University and the author of “The Art of Choosing,” demonstrated in her 1995 study, we are paralyzed by too many choices. People are brand-loyal. The vast majority of U.S. Adults want “their” brand (82%) and “their” retailer (84%) according to the 2017 Study by the International Council of Shopping Center. A brand is a relationship between a provider and their buyer. Brand creates a feeling in the buyer. Brand creates a pride of ownership, a status, a comfort level in the user. If you don’t purposely create, reinforce, and manage your brand with your client you are just another Fill-In-The-Blank commodity. Build your brand. Be your brand. Sell your brand.